Check out this Disco Dad Costume for LAKEWOOD Elementary Auction Party. We have actual 70s Vintage Clothing for Theme Party Costumes. This Lakewood Elementary School Father found everything he needed for the LECPTA Fundraiser Auction “Friday Night Fever” Themed Event. We have true vintage attire or knock-off costumes in all sizes up to plus, 2x, 3x & even larger. You will not believe the Volume & Quality of Costumes & Costume Ideas. We have over 100,000, that’s One Hundred Thousand, 70s Disco Costumes, Vintage Clothing Articles, Shoes, Wigs, Mustaches, Jewelry like Male & Female Symbol Medallion Necklaces, All Signs of the Zodiac Medallion Necklaces, Disco Ball & Hoop Earrings, Peace Sign Belt Buckles & Rings, 70s long scarves, White Belts & White Zipper Boots for Men, Go-Go Boots in all colors of the rainbow with chain belts, earrings, Bracelet & Rings to match, Disco Glitter Platform Shoes for Men & Women, all the Aviator and Mod Glasses & Sunglasses from the 70s and more than you could possibly count in all sizes, in stock now & all year round. That’s just the 70s. We have every decade, every century & any historical theme, in stock, waiting for you discover it. Come put together the grooviest costume you ever imagined. A trip to Dallas Vintage Shop is worth the time and effort. Please allow a minimum of 1 hour to shop, discover, try on & assemble a costume with the ‘Wow” Factor. It is always a blast providing LAKEWOOD AREA with Costumes & Accessories for school fundraiser events, charity events, theme parties and more. Like this Disco Queen ‘Friday Night Fever’ LAKEWOOD Elementary Auction Party Costume. In addition to 60s, 70s & Disco Costumes we have any decade, any century & any theme. Wear vintage attire or quality costumes, either way we have enough for everyone. 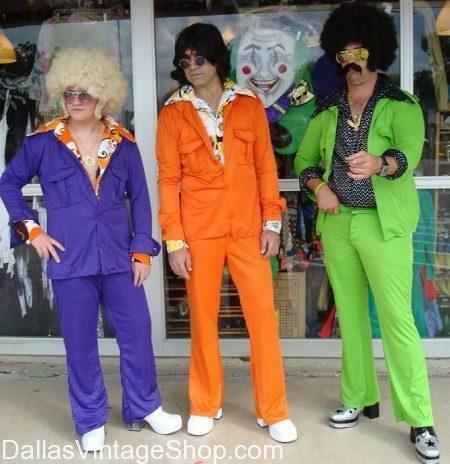 Dallas Vintage Shop has had a blast providing 70s Disco Costume Ideas for the LAKEWOOD Elementary Fundraiser Auction COSTUME Party “Friday Night Fever!” It’s a groovy LECPTA Event at the Belo Mansion & Pavilion that will blow your mind! This highly anticipated party is out of sight man. We have enough 70s Disco costumes, vintage clothing, wigs, go-go boots, platform shoes, groovy jewelry and accessories for everyone. You are in Lakewood Area Dallas category.